According to the information provided by the analytics of the biggest antivirus companies, the number of spyware stealing users? private information including bank details to payment systems access as well as internet payment systems such as e-gold and pay-pal, etc. has greatly increased within the year. Spyware is becoming more and more sophisticated and its harmful influence is constantly growing. Up-to-date spyware penetrates into your computer unnoticed even for an advanced user getting the access to the whole information. Big corporations as well as ordinary users who use their computers for calculations or fee-paying Internet recourses become the victims of computer outlaws. The SecretsSaver Personal protection system realizes a fundamentally new approach to the theft protection of private information. 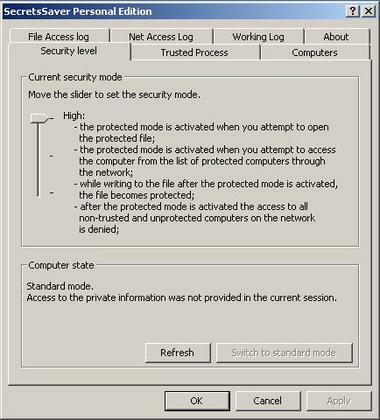 Having received access to the information marked as secret SecretsSaver switches the computer to protected mode where information transfer is possible only to previously user-defined computers. Thus, the attempts on the part of any spyware to steal the information is cut short. Using SecretsSaver Personal you can prevent stealing of any private information including - credit cards numbers; - bank details to payment systems access through the client-bank systems; - bank details to Internet payment systems access (e-gold, pay-pal, etc. ); - any other documents containing confidential information. The system is absolutely easy to install and operate, doesn?t need updating of databases with virus signatures, doesn?t slow down the computer performance and is able to oppose both the familiar and the new harmful code.